If you drive through the village of Karterados all the way down to the coastline you will come to Karterados beach. There is long stretch of black sand with a couple of good fish taverns. The beach is not organized. A dirt road runs parallel to the beach, backed by tall cliffs that takes you all the way to Monolithos. Monolithos is a long stretch of quiet beach with shallow waters making it good for families. It is organized in places with beach volley, basketball, football and a playground that are all part of the Monolithos scene. A life guard is on duty. You will find fish restaurant, traditional taverns, changing rooms, showers and public toilets. You can find the fine black pebbled beach below Exo Gonia. Although quiet, Avis beach offers a couple of places to eat or have a coffee and a snack. There are umbrellas & sun beds and a mini market. Xiropigado beach is the first beach you arrive at when driving along the east coast of Santorini. There is a drivable dirt road leading to the beach. Vourvoulos has a little harbour, umbrellas, changing rooms and a restaurant. The road is lined with beech trees. Kanakari Beach is named after the owner of the abandoned tomato paste factory. 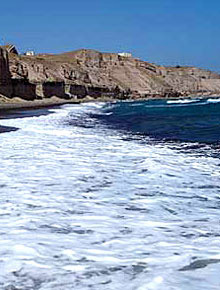 Exo Gialos beach is quiet and relaxing with black sand and pebbles. An interesting feature are the storage areas, known as ‘syrmata’, built into or under the volcanic rock. They are used for housing boats during the winter months. 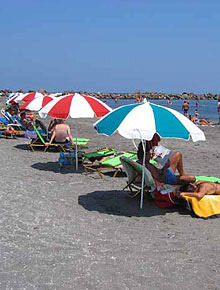 The beach is organized and one can rent sunbeds and umbrellas. There is also a small canteen for snacks.